GRAND RAPIDS, Mich. – The SpartanNash Foundation today donated $30,000 to four West Michigan chapters of the Blue Star Mothers of America, Inc., a nonprofit organization that provides support to those serving in the U.S. Armed Forces and our veterans. The $30,000 grant is the result of SpartanNash’s scan campaign to support our military heroes and fallen warriors and will be used by the Blue Star Mothers to renovate Kozy Korners – a recreational room for veterans living at the Grand Rapids Home for Veterans to use when family and friends visit, for special events and as their own peaceful safe haven. Meredith Gremel, VP, corporate affairs and communications and executive director of the SpartanNash Foundation – the company’s charitable giving arm – presented the grant on behalf of the Foundation. Diane Kidder, president of BSMA Chapter 191, accepted the check on behalf of BSMA chapters from Ionia, Kent and Montcalm counties, Kalamazoo and Southwest Michigan. 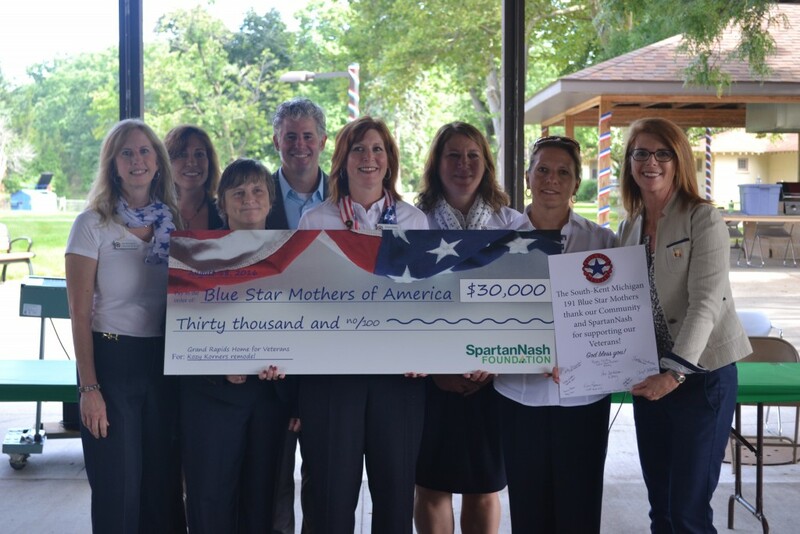 On Aug. 18, the SpartanNash Foundation donated $30,000 to four West Michigan chapters of the Blue Star Mothers of America, Inc. The money will be used to renovate Kozy Korners, the recreational room at the Grand Rapids Home for Veterans. The $30,000 grant was presented during SpartanNash’s bi-monthly volunteer day at the Grand Rapids Home for Veterans. More than 20 associates from the company’s headquarters, retail stores and distribution centers prepared and served lunch for the Home’s veterans and played Bingo. To date, SpartanNash associates have volunteered more than 200 hours at GRHV in 2016. Blue Star Mothers of America plans to use the $30,000 donation to renovate the Kozy Korners space at the Home, including new flooring, paint, furniture, appliances, lighting, counters, cabinets and items for activities. From June 22 to July 4, each of the nearly 100 SpartanNash-owned retail stores and fuel centers in Minnesota, Ohio and Michigan’s central and southern Lower Peninsula invited customers to donate $1, $5 or $10 at the register to support military heroes, veterans and those who paid the ultimate price. Altogether, $182,000 was raised, and the dollars are now being granted to SpartanNash’s national partner, Honor and Remember, and three regional partners – Fisher House Foundation, the Disabled Veterans National Foundation and the Blue Star Mothers of America, Inc. SpartanNash, which owns the retail stores, underwrote the cost of the fundraising campaign, ensuring that 100 percent of dollars raised go directly to the nonprofit partners for patriotic initiatives. In total, $45,000 was raised to benefit Blue Star Mothers of America chapters in Minnesota, Ohio and Michigan’s Lower Peninsula, with grants going to support veterans services, including outreach, support and nearby VA medical centers. The patriotic scan campaign was SpartanNash’s first-ever companywide fundraising effort to support military heroes and honor those who lost their lives defending our freedoms. The Company – under MDV, its military division based in Norfolk, Va. – is the leading food distributor serving U.S. military commissaries and exchanges in the world. The SpartanNash Foundation will execute a total of five scan campaigns in 2016. To date, nearly $525,000 has been raised for local Habitat for Humanity, Special Olympics and patriotic partners. The SpartanNash Foundation was formed in 2013 following the merger of the Nash Finch Company and Spartan Stores. It represents the best of the NFC Foundation and the Spartan Stores Foundation. The SpartanNash Foundation is the charitable giving arm of SpartanNash and is focused on providing grants to nonprofit community partners who are working to end hunger, provide shelter and support our military heroes. To learn more about the SpartanNash Foundation, visit https://www.spartannash.com/corp-responsibility/foundation/. SpartanNash (Nasdaq: SPTN) is a Fortune 400 company and the leading food distributor serving U.S. military commissaries and exchanges in the world, in terms of revenue. The Company’s core businesses include distributing food to military commissaries and exchanges and independent and corporate-owned retail stores located in 47 states and the District of Columbia, Europe, Cuba, Puerto Rico, Bahrain and Egypt. SpartanNash currently operates 160 supermarkets, primarily under the banners of Family Fare Supermarkets, Family Fresh Markets, D&W Fresh Markets, Econofoods and SunMart.